In recent decades research has shown that Sleep Disordered Breathing (SDB) is a major contributor to health problems. We always recommend that are patients undergo a sleep study to determine if there SDB is limited to snoring or if it includes obstructive sleep apnea. 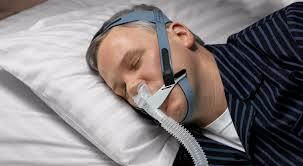 Sleep Disordered Breathing typically occurs when the airflow through the nose or mouth is obstructed during sleep. The airflow obstruction is usually due to relaxation and poor muscle tone around the throat and jaws and other underlying causes. The most common are chronic mouth breathing, poor forward development of the jaws and poor diet and nutrition leading to weight gain. Additionally, orthodontics with extractions can exacerbate breathing issues. Traditionally treatment for SDB, particularly obstructive sleep apnea, is the use of a Continuous Air Pressure (CPAP) device. This treatment modality is effective, however compliance can be poor. Alternative treatments are intra-oral appliances that are both convenient and alleviate SDB. MYOSA Appliances for Snoring are a convenient and effective way to alleviate snoring. It is a myofunctional sleep appliance that functions by posturing the lower jaw slightly forward, correcting tongue position and opening the bite, which has the effect of opening the airway. The appliance is made of silicone and has flexible sides with air spring base therefore minimizing impact on the TMJ and making it a good appliance for those with TMJ disorders or those that grind and clench their teeth. No fitting or adjustment required for immediate use. High sides provide good retention without moulding. Breathing holes effectively regulate breathing for mouth breathers. Tongue tag guides the tongue forwards and upwards into the correct position. Tongue elevator holds the tongue in the correct position. Easy on jaw joints. Suitable for TMJ patients. Provides optimum jaw position and vertical opening for most patients.